Doing the job right is absolutely paramount to safety, quality, and ultimate customer satisfaction. This set of five precision industrial grade preset torque wrenches are factory set and calibrated to the five most used lug nut torque settings. 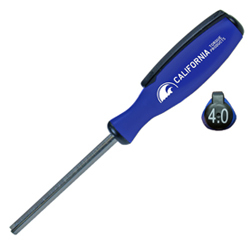 Included with this set is the 2503CTPRH micrometer torque wrench to service any other torque values that may be needed. This system was developed specifically for the wheel and tire service industry to provide long term accurate torque control and durable enough to hold up to the demands of the tire and wheel service environment. 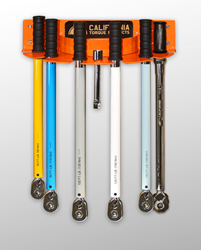 Each one of the five wrenches is offered in a different color for easy identification. The 5 settings are 65, 80, 100, 120, 140 ft-lbs. Each wrench is equipped with a 1/2" drive that has a bi-directional, 48 tooth, quick release ratchet. 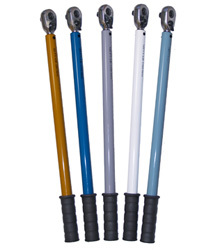 All wrenches have an ergonomic, chemical resistant, rubber, comfort grip handle. The 6 piece set is supplied with a high visible orange rack that mounts on the wall. Each wrench has an accuracy of +/-3%, which meets ASME B107.14M-1994 and ISO standards. The preset wrenches are each shipped in durable, blow molded, plastic cases. 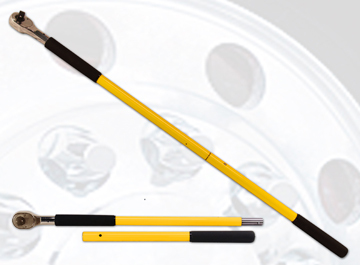 The micrometer torque wrench is shipped in a polypropylene tube. The six wrenches are individually tested and are supplied with individual serial numbers. The preset torque wrenches are supplied with a certificate of conformance, while the micrometer torque wrench is supplied with a certificate of calibration. The system comes with a 1 year warranty on manufactured parts and workmanship. Doing the job right is absolutely paramount to safety, quality, and ultimate customer satisfaction. This set of five precision industrial grade preset torque wrenches are factory set and calibrated to the five most used lug nut torque settings. This system was developed specifically for the wheel and tire service industry to provide long term accurate torque control and durable enough to hold up to the demands of the tire and wheel service environment. Each one of the five wrenches is offered in a different color for easy identification. The 5 settings are 65, 80, 100, 120, 140 ft-lbs. Each wrench is equipped with a 1/2" drive that has a bi-directional, 48 tooth, quick release ratchet. All wrenches have an ergonomic, chemical resistant, rubber, comfort grip handle. The 5 piece set is supplied with a high visible orange rack that mounts on the wall. Each wrench has an accuracy of +/-3%, which meets ASME B107.14M-1994 and ISO standards. Each wrench is shipped in durable, blow molded, plastic cases. The five wrenches are individually tested, and are supplied with individual serial numbers and given a certificate of conformance. The system comes with a 1 year warranty on manufactured parts and workmanship.